Meet Hania, she’s a Leo. Her theme is the elusive yet wise “Iguana”, designed by Adam Deer & Jenn Pennington. Hania is currently kicking it Miami, Florida style making friends and passing out the Pacifico love. Since our bus is lizard based, it's cold blooded. Which is cool. "Hania" has finally made it to the southernmost city...Key West,FL. I will be her driver for the next few months.Igwana have some fun? 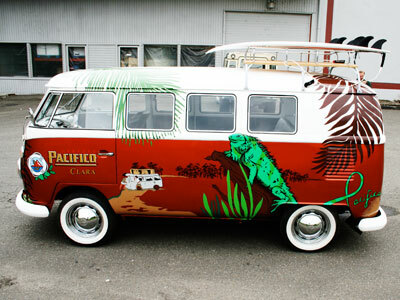 Come down to the Keys and enjoy a ice cold Pacifico and you might just see her riding around.